My hubby and I got our 18 month old trained to fall asleep by us rocking her. It’s our fault since she is our first and we loved to hold her as she fell asleep. I am now at my wits end. She wont fall asleep unless we hold her although we do transfer her to her own bed where she sleeps all night…. and sometimes it can take up to an hour or even longer before she is out. I am going to try your method and see if we can teach her to just lay in her own bed until she falls asleep. wish me luck! Thank you! I’ve been beating myself up that our 20 month old twins need me to sit next to their beds for up to 40 minutes before they fall asleep. We trained them very early on to settle themselves in their cots and since 9 months no real tears, just chatter. A week ago today our son climbed out of his cot 4 times (once falling onto his head while I was in the room) it was this incident that made us think they were ready for beds. We converted their cots to beds and the first night we tried the leave 2 minutes, return, leave 4 minutes, return, but to no avail so we ended up sitting on the floor and they were both asleep within 10 minutes. For the rest of the week we’ve been sitting in their room on the floor not saying anything and they’ve fallen asleep within 40 minutes. I was all ready to commence leave, return again tonight, but after reading this, I’ll give the sitting more time. I like the gradual approach so tonight I’ll try sitting in the rocking chair so they can see me. Next week perhaps standing by the door. I cannot express what a relief your story is!. Thank you! Hi Stacey, thank you for your nice comment! Sounds like you are making great progress… I agree… try the gradual approach that you mentioned, I think it will work! Hope it goes well for you! Hello Barb i am in the same exact position can you let me know how this worked for you please ! Hey. My son is 20 months old. We just converted his bed into a toddler bed and have been trying to get him to go to sleep on his own.. it works at nap time, but not at night time. We have always rocked him… for the past two nights we have sat next to his bed. Do you think it would be best if both my husband and I were in the room, or would it be equally as good if we switched nights? Hi Ashley, thanks for your comment! I think it would be equally as good if you switched nights, as long as you both keep the same routine. Let us know how it goes, and good luck!! It was great to read your mission accomplished series – although I’m sure it seems like a distant memory to you now. I am on day 3 of teaching my 16 month old to sleep by herself in her crib, motivated by the fact that she wakes at least 5 times a night. Both nights have taken about 50 minutes of me sitting infront of her crib whilst she plays with her blankets and jumps up and down before finally lying down and going to sleep, thankfully without any crying (which I was expecting hence haven’t tried it before.) I have gone to bed both nights with a sense of achievement similar to winning a marathon, only to be disappointed that the night wakings seem to have increased not decreased!! You don’t mention too much about how much smarty pants was waking at night but I guess I am basically looking for someone to say, hang in there it may get worse before it gets better… but it will get better….won’t it? Hi Justine! Yes, it gets better … it is a bit of a rollercoaster ride, in that it sometimes gets worse, you can have setbacks along the way. I found that Smarty Pants had fewer night wakings when we did this, and my theory was that since he didn’t need us lying beside him to fall back asleep, he might have been waking up and just lying in bed on his own to fall back asleep, and not waking us up in the process. Basically what I find is, when he fell asleep in a certain way, that is how he needed to fall asleep again if he woke up. So if we weren’t in bed with him and he woke up, then he wouldn’t need us in bed with him again to fall asleep again. I wish you lots of luck and am sure it will get better! Cheers! Hi There!!! My lil one is almost 3. I’ve developed some very bad habits with her n coz of this I’m paying for it!!! I’m going to give ur suggestions a go definitely!!!! As my partner and I wwnt to hve another baby. I’m daunted. As I hve trouble even laying on the bottom hlf of her bed without there being major tantrums!!! There’s every possibility I cld be sitting in there for hrs isn’t there? Hi Lace, yes, you could be sitting there for awhile the first few nights, hopefully not much longer than that… but bring a book or something that you can do, just in case! Thank you for this article. It gives me hope that our soon to be 2 year old will be able to fall asleep on his own soon! My question is; was your son in a toddler bed already? If so, at what age did you make the switch? Our son is still in his crib. Would you recommend beginning this process in the crib or transitioning to the toddler bed first? Thanks so much! Thanks for your comment and question! Our son was in a toddler bed already when we started this. We made the switch when he was about 21 months old. I think it is probably better to switch to a toddler bed first, to avoid too many changes at once, or possibly getting him used to sleeping on his own in a crib, and then having to go through the same again if he gets uncomfortable falling asleep on his own in the toddler bed after you switch. I don’t have experience with that, but it is my feeling. Good luck!! Hi – my 19 month old has been a perfect sleeper from 8 weeks of age and never waking through the night. Then something happened at 17 months – he just didn’t want to go to sleep. As soon as you finish reading his bedtime books he starts protesting and screaming. We are now at our wits end. I came across your article and it was very reassuring. Yesterday was the 1st night I sat in his room and he screamed on and off for 3 hours before finally falling asleep. Tonight will be the same – he is still screaming and we are at 2.5 hours. He’s still in a cot and he falls sleep standing up leaniing on the cot and then wakes himself up. We’re not sure what to do? Hi Irene, that sounds like a very challenging situation, especially if he falls asleep standing up. You might want to talk to a sleep consultant about it, but for now I would still stick with it and be firm and consistent with the bedtime routine. I think consistency is key, along with sending a clear message that it is bedtime, through the routine. Great article! My daughter will be 3 in September and like many of the other parents mention here, used to fall asleep on her own and one day would not. So for a very long time now my hubby and I have been laying with her to fall asleep. I have decided today, after reading your article that tonight is the night we start the same technique. You have inspired me and reminded me that it is possible! Great job, thank you for the motivation!! Hi Megan, thank you for the thanks! Best of luck to you! Quick update…the first night it took her two hours to go to sleep, last night one hour and tonight just 30 minutes! It hasn’t been easy but we are making great progress!! Thanks for the update Megan! Sounds great so far! I wish you the best and lots of strength! This sounds promising! Thank you for putting this out there to help others! GREATLY APPRECIATED!! My daughter will be 3 in Jan. She’s been sleeping in her own bed since she was 5wks old, I was strict on her NOT sleeping with us because I didn’t want that fight in the future. We transitioned to the toddler bed a little before she was two. I used to rock her to sleep every night. She’s out of the rocking stage but I sit on the floor either patting her booty or running my fingers through her hair to fall asleep…which works (sometimes quickly, sometimes not). I’m going to try to stop doing this tonight with your method. My other issue now is that she seems to wake up EVERY night and wants to sleep with Mommy. If I say no or try to get her back to sleep she cries SO hard she ends up throwing up which then means a bath & load of laundry at 2 in the morning. Most of the time I’m so exhausted I cave & we end up in the spare bedroom. What would you recommend to fix/change this behavior? I MISS MY BED & my husband!!! Hi Steph, thanks for your comment, and it is my pleasure to share my experiences to try and help others out there like you! Every child and situation is different, but it is worth a shot to try it. About your question – I think you should try this technique when your child wakes up in the middle of the night. It might be exhausting at first though. So when she wakes up in the middle of the night, go to her and sit beside the bed, but don’t get into the bed, and sit there until she falls back asleep. Then the next night, if she wakes up in the middle of the night again, do the same, gradually increasing the distance between you and the bed. Hopefully then eventually, if you continue this, she will stop waking up in the middle of the night, or if she does, she will just fall back asleep on her own. Hello, I have an 18m old. My husband and I have been rocking her until she was fully asleep since she was an infant and then putting her in her own bed, as did some of the other parents mentioned above. We now realize (she is our first) that we didn’t do ourselves any justice doing it that way. We are now trying to get her to go to bed and stay asleep on her own. We still cuddle and rock for a short time and then put her in her bed -almost- asleep. She immediately wakes up! We have been trying to not go back for a period of time and then going in saying “it is bedtime, love you” laying her back down and leaving. However, she still screams. My husband is a lot softer than I am when it comes to her cries for help. I am glad to hear that other parents have tried without success. I am going to discuss your method with my husband so that maybe it will ease is pain a a little and hopefully we will be able to get her to bed quicker. Since a weekend is coming up it seems liek the best time to start! I love the advive! Do you have any on potty training? Thanks for your comments and kind words Emily. I wish you lots of luck and strength, as I know it is difficult. I now have three kids, and my third is 15 months old. 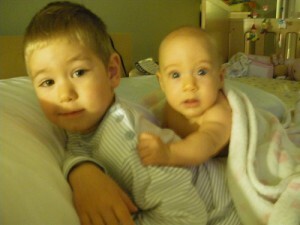 We were much stricter with our third going to bed than with our first two, mainly out of necessity. We lay him down and he falls asleep on his own without crying, and sleeps through the night. It is much different than with our first two! My advice is to be consistent between the two of you as you go through this, and it should work for you. I do have a few posts about potty-training, here is a link to them: http://thedadjam.com/?s=potty+training&x=10&y=6 Cheers! Thank you for this post. I’ve been struggling with my 2 yr old to sleep on his own on and off since my 5 month old was born. We tried cold turkey tge other night and I think it made it worse. I will try your method now. You are welcome Julie, I hope it works for you too, good luck! Thank you so much for this series of posting. We are trying the exact same method and I was about give up after 2 weeks…until I came across this blog! Our son is almost 2.5 years old and he used to be a great sleeper in a crib. After bedtime routine, I used to just put him in a crib, give a good night kiss and he’d fall asleep on his own. He’d sleep through the night of course. Everything changed when he figured it out how to climb out the crib little over 2 weeks ago. He would not stay there so we had to convert the crib to toddler bed. First couple of nights were awful… I had to physically put him back in the bed for countless times with him crying. Now, 2+ weeks later trying to follow Supernanny’s method, he’d fall asleep with me sitting almost by the door. However, the problem is the night time waking. He’d wake up around midnight or 1am, then almost EVERY hour after that. I’d just walk him back to his bed without saying anything (maybe occasional “shhh”) and he’d fall asleep in few min but he’d wake up again in hour or so. I take it your son didn’t have this issue? I wonder if it’ll get better…I’m just exhausted! We tried to put a gate outside his door but he’d just climb over that too and we can’t let him cry too long or he’d wake up his big sister in the next room. Any idea/advice? Again, thank you so much for your article and hopefully we’ll see a good results after 8 weeks or so like you did! Hi Mitsy! Thanks for your comment, I hope you start to get some good results soon! My son didn’t wake up at night after he fell asleep… what we found actually was that once he was able to fall asleep on his own with us beside his bed, if he did wake up at night, he just fell back asleep on his own. I think you are doing the right thing to consistently bring him back to his room without saying anything, and I think if you continue to be consistent, and keep having him fall back asleep on his own, eventually he will just fall back asleep on his own without getting out of bed and coming to you. Thanks for your comment Isha! Good luck, I hope it works for you too! It’s uplifting to read that some of you got your kids to fall asleep on their own, and can barely remember those early months. I don’t think I’ll be able to hold his weight any longer, he is only gonna get heavier and I don’t know what I am going to do. Has someone gone through something similar and can give me advice? Or is going through it now and we can at least feel heard..? I feel I need to reach out to parents in my situation, as parents of “good babies” do not understand. AT ALL.